Could this also be a food blog? I love food! I bet you love food! So blogging about food sounds like a win-win. While I’m known among family and friends for my insatiable sweet tooth, I recently read that sugar gives you wrinkles (WHAT?!) and have since cut down on the cupcakes (I may or may not have been one of Sprinkles’ biggest fans). I was cool with a well-deserved scale increase after a red velvet bender, but wrinkles? You can’t get rid of those at the gym. So lately, I’ve been trying to avoid sugary sweets and processed foods, focusing on recipes filled with fruits and veggies of the seasonal, local, and organic variety (go big or go home, right?). So far, it’s been downright delicious. Even the husband is on board with the green smoothies (pictured above, recipe below). Since this girl still needs chocolate (and dark chocolate has antioxidants, score! ), I’m all about trying any health-ified dessert recipe that pops up on Pinterest. So, I’ll also use this blog to share any hits from our kitchen and warn you about the misses (these Brussels sprouts are bomb; date brownies were a disaster). Since October, I’ve been on the green smoothie train. When I read that these nutrient-packed drinks have big-time beauty (and of course, health) benefits, I ditched my usual oatmeal and jumped aboard. So far, I’m seeing a big difference in my nails—they are way stronger. 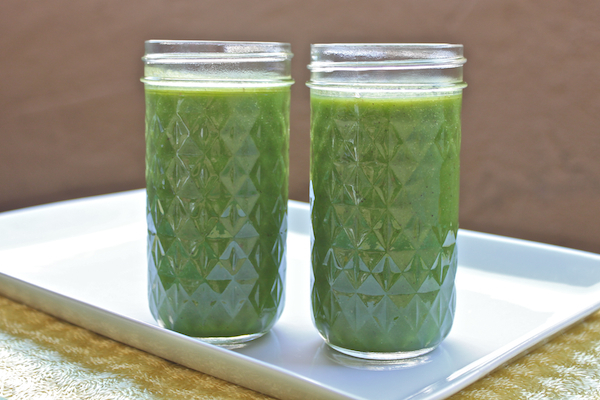 Here’s one of my favorite green drink combos, adapted from Kimberly Snyder's celeb-approved recipe (and whose book, The Beauty Detox Solution, is my new nutrition Bible). At first, I was afraid these smoothies would taste like grass, but you mostly just taste the fruit. If you're a kiwi fan like me (I may or may not have been a kiwi once for Halloween), you'll love this one. Add water, lettuce, and spinach to blender; blend until smooth. Add apple and kiwi; blend again. Then, add banana and lemon juice, and blend once more until smooth. Serve and enjoy. Note: This will be closer to room temp, so add a couple of ice cubes if the warm taste is hard to swallow.